The family of Samuel DuBose emotional as yet another African family is ripped apart by the State. CINCINNATI––A Ohio judge has declared a mistrial in the case of a white former killer pig, Ray Tensing, who murdered Samuel DuBose during a traffic stop last year. 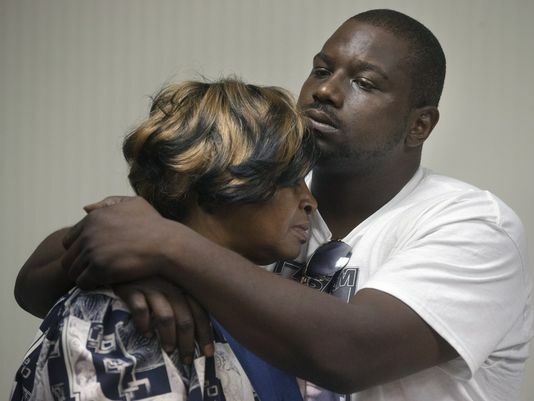 Samuel was terrorized and shot in the head by Tensing after the murderous cop pulled him over. Tensing stated that he pulled Samuel over because his car was missing a front license plate. We Africans know that the pigs don’t need a reason to murder us in the streets. The jury on Saturday was unable to reach a verdict for Tensing, who was charged with a mere voluntary manslaughter charge even though his callous murder of Samuel was caught on police body cam. The case is now back in the hands of prosecutors, who must decide whether they will retry the case or dismiss it. Killer cop Tensing remains free on a $1 million bond while Samuel’s loved-ones are left to mourn his death in despair. After meeting with the media, Terina DuBose Allen, Sam's sister, visited Sam's grave on Sunday. Through sorrow, she expressed to her brother, "Sam we are fighting for you." Al Gerhardstein, an attorney for DuBose's family, said they are "incredibly upset" and will ask for another trial. "They are at their wit's end. They have been on hold since Sam was killed," he said after the verdict. "With the video evidence as clear as it was, [jurors] should not have been stuck," Gerhardstein added. Tensing, whose only consequence so far was being fired as a University of Cincinnati's cop, faced a measly 15 years in prison if convicted for the murder. We demand that the pigs withdraw from our neighborhoods! The police are an occupying military force which exists in our communities to terrorize and oppress us. They function to protect the political and economic interests of the white ruling class, at our expense. “We want the immediate withdrawal of the U.S. police from our oppressed and exploited communities. We believe that the various U.S. police agencies which occupy our communities are arms of the U.S. colonialist state which is responsible for keeping our people enslaved and terrorized. We believe that the U.S. police agencies do not serve us, but instead represent the first line of U.S. defense against the just struggle of our people for peace, dignity, and socialist democracy. Join the African People's Socialist Party!